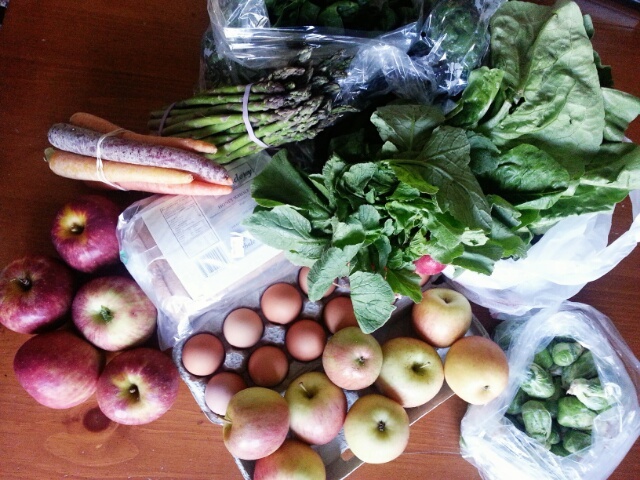 The haul: 5 Stayman apples, 8 Fuji apples, rainbow carrots, asparagus, radishes (though the overhead shot really shows more radish green than radish root), a pound of spinach, a head of (really sandy) romaine lettuce, Brussels sprouts, eggs, and bread (Breadery honey whole wheat). We ate the asparagus immediately; it was so fresh that some of the ends didn’t even snap. I love asparagus for its ease of preparation: snap the ends, rinse the spears, tumble them into a pan with some olive oil, salt, and pepper, and roast them until they start to look a little shriveled. Done! They get all tender and delicious. Even the Little Prince loves them. The apples are really piling up; we are drowning a bit in apples here. Since the Little Princess is just starting solid foods (she seemed to like her puree of CSA spinach last night), I think I’ll be making applesauce this weekend. And apple cobbler for us older folks, too. I also dropped by the Miller Library farmer’s market yesterday. It was great to see all the farm stands again! Not much in the way of fresh produce yet but if you want to stock up on little baby herb and tomato plants, now is the time. I picked up two little cherry tomato plugs from Love Dove Farm; really looking forward to fresh-off-the-vine tomatoes this summer, assuming I can get to them before all the back yard wildlife. 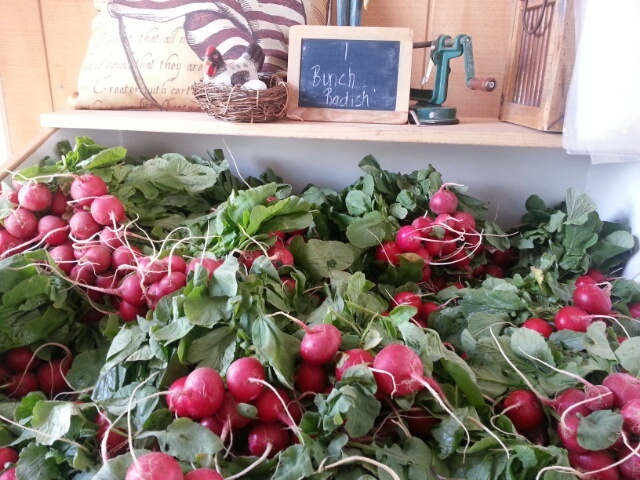 Breezy Willow’s spring CSA runs for just one more week, and then it’s a two-week break until the summer one starts up. 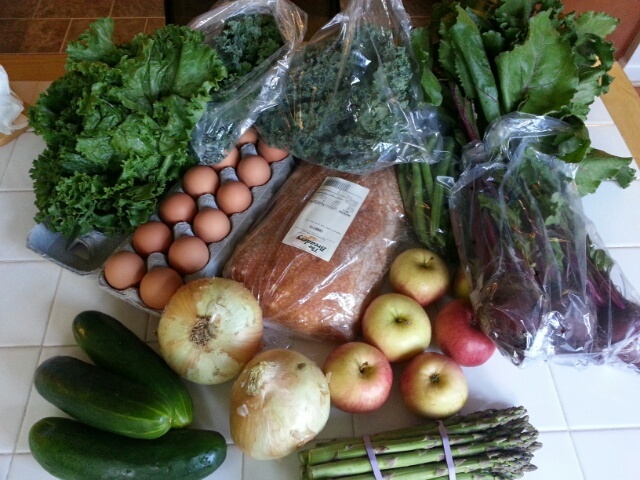 I’m looking forward to doing a lot of farmer’s market shopping over the hiatus. 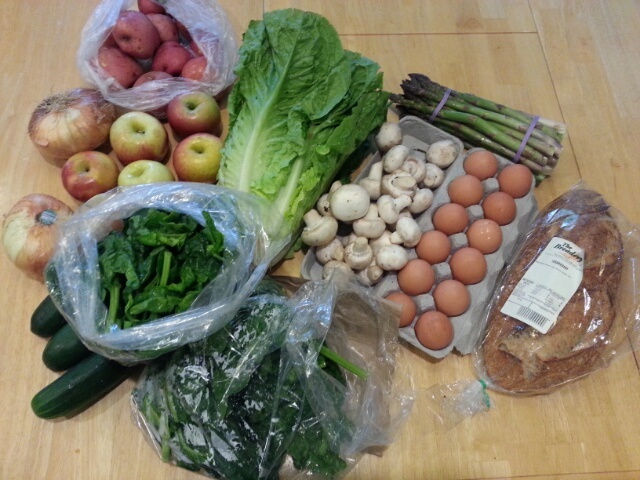 Week 9 of the CSA: red potatoes, Vidalia onions, apples (Fuji, definitely looking a little past their prime as we near the end of cold season storage), spinach, cucumbers, romaine lettuce, mushrooms, asparagus, eggs, and bread (Breadery sourdough). Progress report: So far we’ve already eaten the mushrooms (sauteed in butter, served alongside steak), asparagus (seasoned and broiled, served alongside stir-fried beef and eggplant), spinach (wilted, seasoned, and served as a side, with some pureed for the Little Princess), and cucumbers (refrigerator-pickled). The romaine lettuce is going to get brushed with a vinagrette and thrown on the grill. I sliced up onions last night after the kids went to bed, and they (the onions, not the kids) are going to get sauteed up with some sliced peppers tonight (busy mom tip: prep as much as possible the night before). Potatoes will be quartered, folded into a foil packet with some oil and herbs, and left on the grill to roast in the carryover heat; ditto the beets from last week. So happy that grilling season is back again! Our patio garden is also coming back to life with some thyme, basil and habanero peppers (from the Thursday farmer’s market at East Columbia library) as well as parsley, rosemary, poblano, and ghost peppers (from the Sunday market at Oakland Mills). Looking forward to adding some tomato plants too, and probably more peppers. Someday we’ll graduate to a proper plot of land in our backyard, but for now, the patio container garden is about all I can handle. 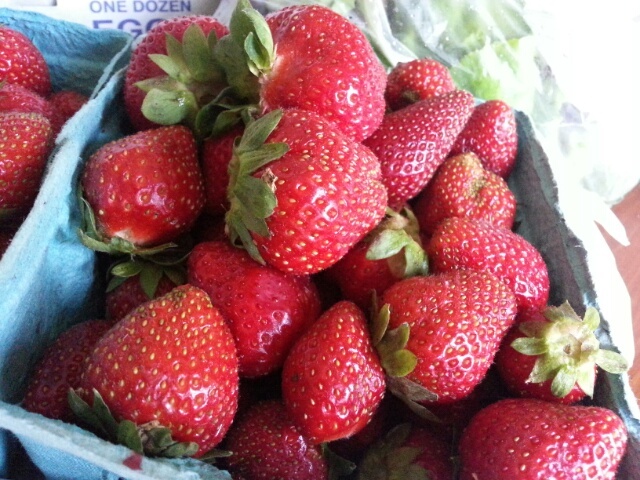 The guy at the TLV Tree Farm stand said that his strawberries were looking good, and would be available in a couple more weeks. I’m really looking forward to taking the Little Prince berry picking again this year. Week 7 of the CSA: spinach (top left) is covering the green beans; there’s also romaine lettuce, mushrooms, apples (Fuji, I think), cucumbers, Vidalia onions, red potatoes, eggs, and bread (Breadery Kid’s Delight). 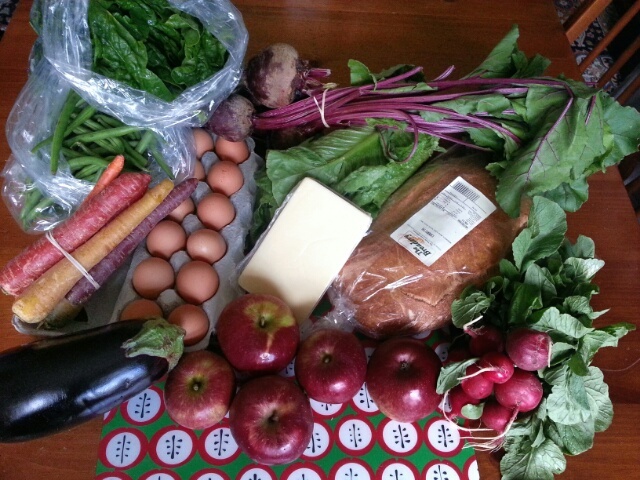 And here’s the bounty from week 8: green beans, spinach, rainbow carrots, beets with luxuriant greens, more romaine lettuce, eggplant, apples, radishes, eggs, bread (Breadery ciabatta), and a bonus item of cheese (I picked cheddar). I love eating radish greens. The first time I tried them I was a bit taken aback by the sharp, peppery flavor, but now I absolutely love them, especially sauteed in butter. 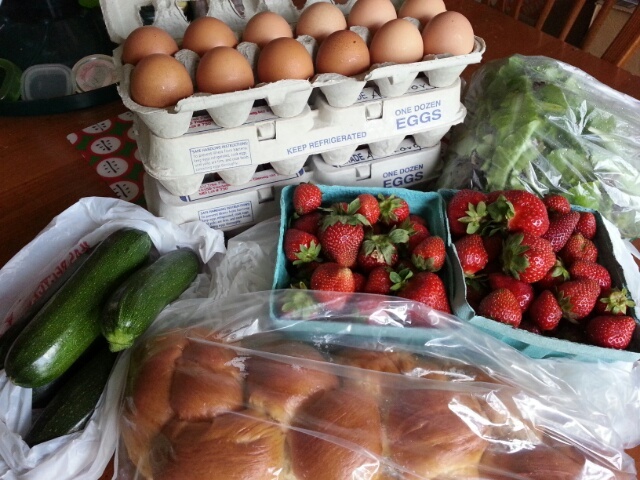 It’s also the first week of May, which means that the Howard County Farmers Markets are starting back up. I’m so excited. 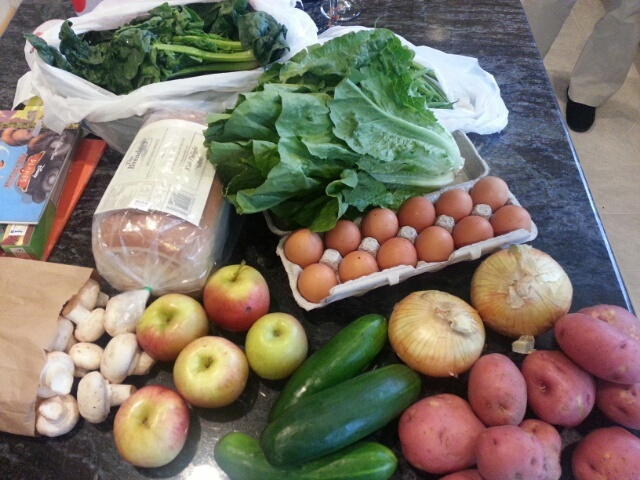 I love my CSA share, but I also like shopping for myself too.